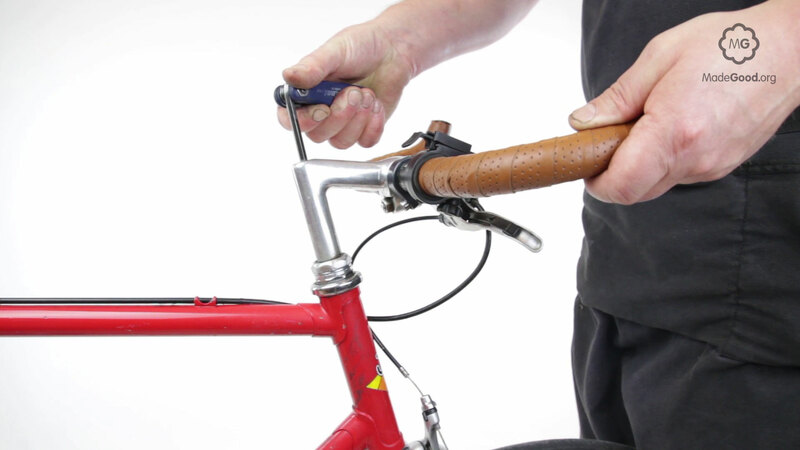 It's simple to adjust the height of the handlebars with an old-style threaded steerer-tube as the handlebar stem telescopes into the steerer tube and expands to lock there. In this system the handlebar stem is a completely separate system from the headset bearing that allows the front wheel to 'steer'. 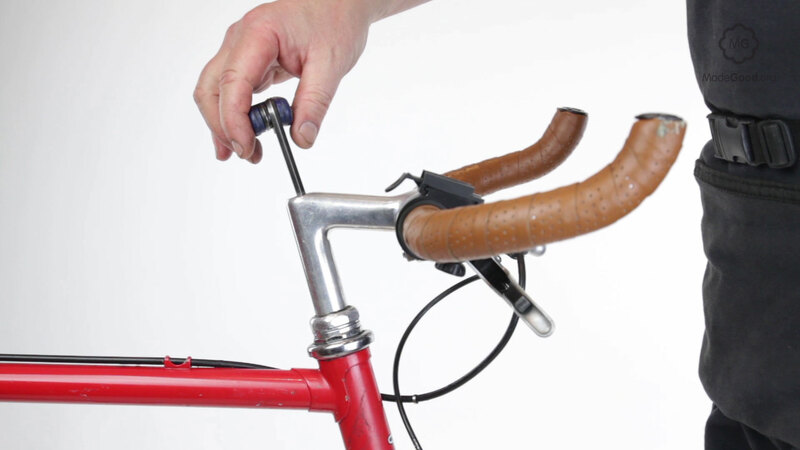 Measure how much of the handlebar stem is visible above the lock-nut on top of the headset. 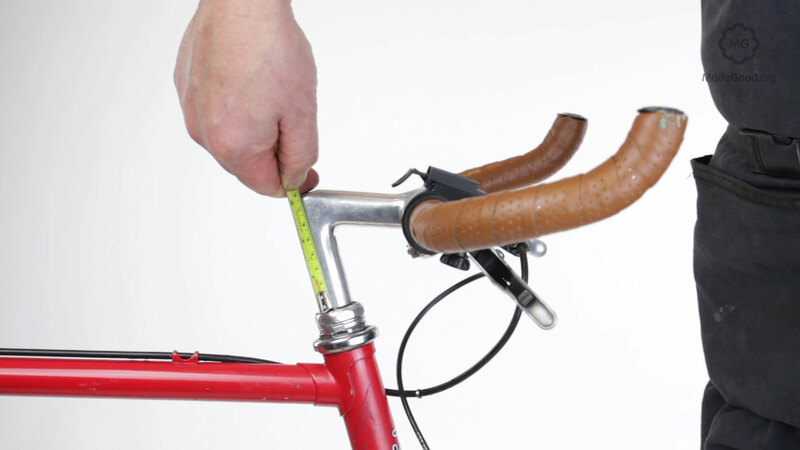 Use a tape measure before and after any handlebar adjustment or maintenance, that way you can go back if you don’t like the new position. Follow the line of the headtube to find the head of the expander bolt. It will have a hexagonal head or hexagonal socket. Unscrew the bolt a few turns to begin. Stand in front of the bike facing the front of the handlebars with your head on the centre-line of the bike. Holding the front wheel between your legs try and turn the bars. If they won’t turn tap down on the head of the expander bolt with a soft hammer, this will release them unless they are seized. 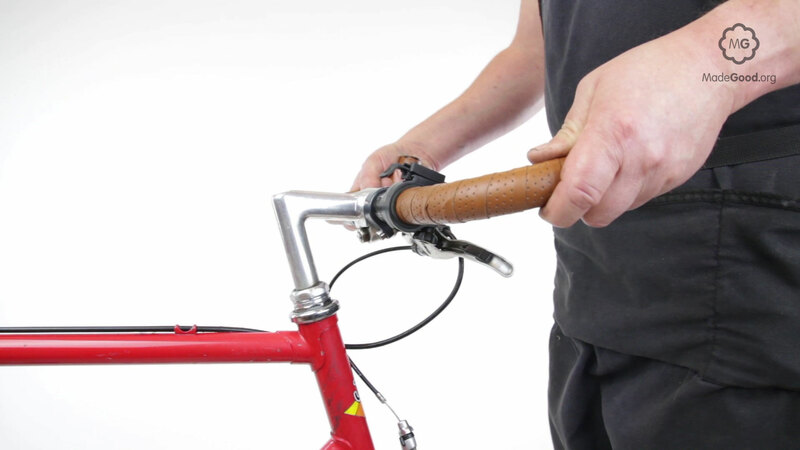 Pull the stem right out of the frame with a combined turning and lifting action. 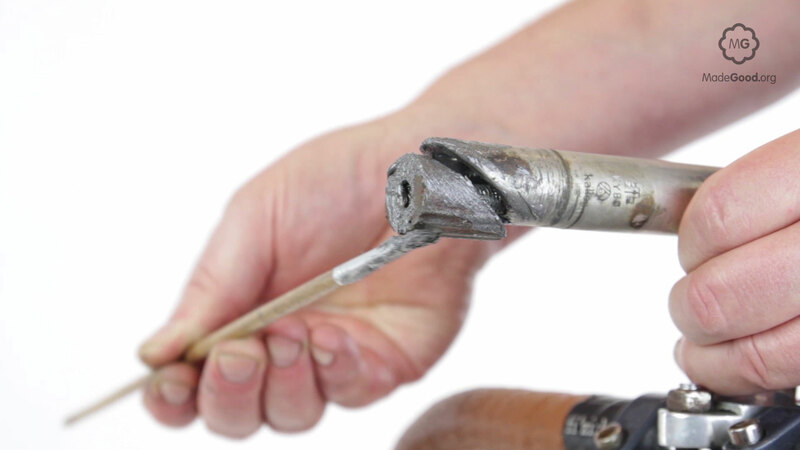 There are two types of fitting; a round tapered expander nut that pulls up into the stem which has slots that allow it to flare out and grip the inside of the steerer-tube, or a quill stem – it’s called this because the end of the stem is cut diagonally like the nib of a feather pen – which has a slanted nut that sides up the diagonal to wedge the stem in the steerer tube. Note the position of the ‘minimum insertion’ safety limit mark. An aluminium handlebar-stem can lock itself into a steel frame by a chemical process known as ‘bi-metallic corrosion’ or ‘cold setting’. 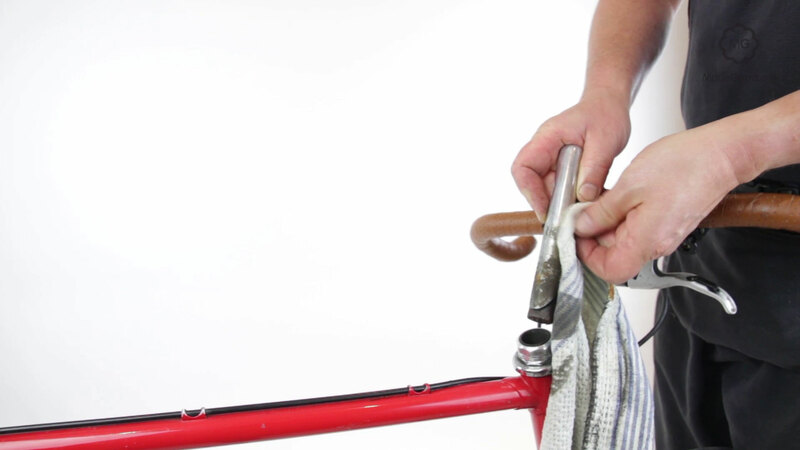 To avoid this remove the handlebar-stem once a year, wipe both surfaces then apply a coat of anti-seize grease to the inside of the steerer-tube the threads of the expander bolt and around the nut. If the bike is run without mudguards in wet and salty conditions – the salt can come up from the road, or from the rider’s sweat – the surfaces need to be checked and greased more frequently, maybe as often as once every three months. 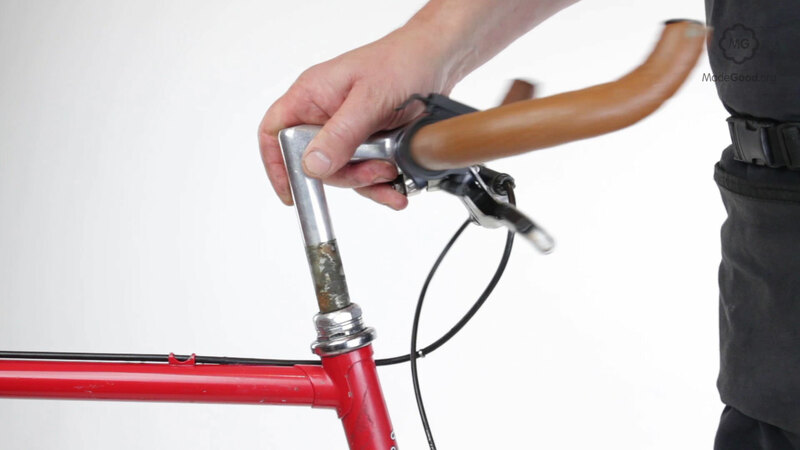 Reposition the handlebar stem and do up the expander bolt until the stem stays still but isn’t locked. Check the stem is in-line with the front wheel. It’s easiest to do this if the front wheel is aligned to the frame. Check the bars are at the right height. Then hold the front wheel steady with your legs and lock the stem in place by screwing the expander bolt down to pull the nut upwards to wedge the stem. The stem needs to be tight enough not to move in rough conditions but it’s good if it’s not jammed completely. If you crash it’s better for the bars to turn than to break or injure the rider. If you carry a heavy load over the back wheel the stem needs to be tighter than if the bike only carries the rider. This website and its content is copyright of MadeGood Social Enterprise - © MadeGood Social Enterprise. 2018 All rights reserved.